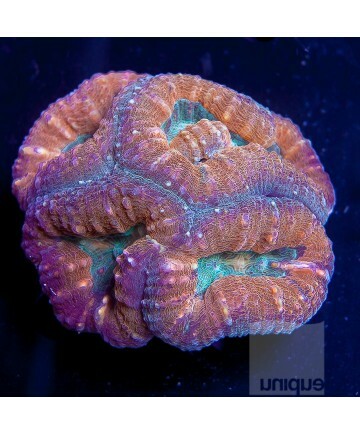 Lobo’s are a Brain Coral with large fleshy polyps and often called Lobed, Carpet, or Open Brain Coral. Lobos are available in many color forms including bright red, green, orange, gray, tan, or brown. An excellent choice for beginning reef aquarists. Lighting: Moderate to bright lighting of the proper spectrum such as that provided by the Orphek Atlantik, PR156XP, and PR72 Reef Pendants. Feeding: The symbiotic algae within it’s body provide most of its food but ccasional feedings of liquid micro plankton food is beneficial. Compatibility with other corals: Semi aggressive, can sting other nearby corals with its sweeper tentacles. Use care in placement.